Set of Nine (9) Gemstone Pyramid Plate. 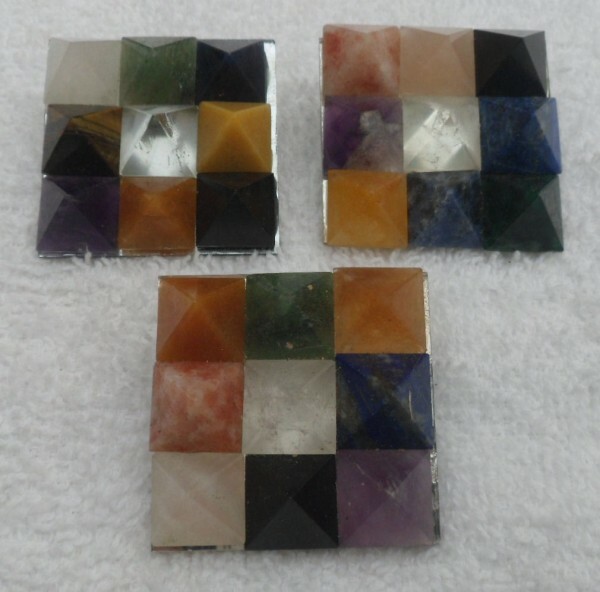 Set of 9 Pyramids made from natural gemstones representing each of the nine planets. Price is for one set. The pyramid shape itself is a supernatural source of power and energy. There is power in the pyramid shape which is believed to have a generally balancing effect on the Vastu of the surroundings. It is a structure of perfection that gathers negative energy from the surroundings and releases it outward. Pyramids have power to drive off negativity and attract good luck, peace, harmony and prosperity. They focus energy to the apex and bring in harmony and positive vibes all around the place. Gemstone pyramids bring the positive energies of the planets they represent and works like a Navrartna. Nine Pyramids in one place enhance energy, while focusing their energy inward toward the center of each creating a wide energy field. A powerful tool for cleansing a home or dwelling area of negativity, place this pyramid plate in the center of a room, on a table or desk or other central location to channel positive harmonious energies and to deflect and dispell negative energies. Those who meditate will find instant calm when this pyramid plate is near. This pyramid plate can be placed under your bed while sleeping for deeper rest and more fulfilling dreams. Please Note: Every pyramid is different and unique. As stock constantly changes the pyramids shown might not be available but we will send you a pyramid very similar.